What do the error/information codes indicate? (LS-WVL, LS-WXL series) - Details of an answer | Buffalo Inc. 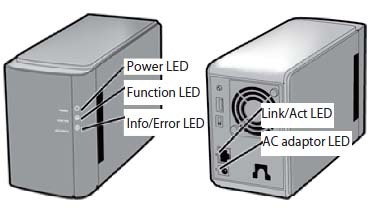 There are 5 LEDs on the LinkStation: "Power", "Function", "Info/Error", "Link/Act"and "AC adaptor". Glowing Blue The LinkStation is powered on. Blinking Blue The LinkStation is starting up or shutting down. LED is OFF The LinkStation is off. Glowing Blue DirectCopy is ready (lights for 1 minute). USB device is dismounted (lights for 5 seconds). The function LED (blue) and the info/error LED (orange) blink together if an error occurs during DirectCopy. Detach the USB device from the LinkStation. Reattach the USB device to the LinkStation. The Info/Error LED blinks orange when there is a message. The message is coded by the pattern of blinking. Note: The messages are also available (uncoded) in NAS Navigator2. 10s place The LED illuminates for 1.0 seconds every 0.3 seconds. The number of flashes is the tens place of the information code. 1s place The LED illuminates for 0.5 seconds every 0.3 seconds. The number of flashes is the ones place of the information code. I10 System temperature may have exceeded the maximum safe value. Move the LinkStation to a cooler location. Do not place objects in the area around the LinkStation. I11 The bad sectors in the hard drive may have reached a dangerous level. I12 Operating in degraded mode. I13 Formatting the RAID array. I14 Checking the RAID array. I15 Examining the error statu of the RAID array. Transfer speeds are slower during the examination process. I16 Creating the RAID array. I17 Resyncing the RAID array. Transfer speeds are slower during the resyncing process. I18 Rebuilding the RAID array. Transfer speeds are slower during the rebuilding process. I19 Writing 0s to the RAID array, erasing all data. I20 Checking the hard drive. I21 Checking the hard drive. I22 Erasing the data of the hard drive. I25 Updating the LinkStation firmware. Do not turn off the power during the updating process. I26 Initializing all settings in the Web Admin interface. I27 Checking a USB hard drive. I28 Formatting a USB hard drive. I32 The RAID should be rebuit or a drive should be formatted.Normally this is displayed after a hard drive has been replaced. Rebuild the RAID array or format the hard drive in the Web Admin interface. I46 Data migration or conversion (RAID migration) is in progress. Do not turn off the LinkStation power. I47 Data migration or conversion (RAID migration) is in progress. The Info/Error LED blinks red to indicated an error. The error may be identified by the pattern of blinking. The number of flashes is the tens place of the error code. The number of flashes is the ones place of the error code. E04 The firmware is corrupted. Concact technical support for assistance. E10 The LinkStation is running on the UPS battery due to a power outage. The system will no be shut down safely. Check that power is being supplied to the UPS, and if there are no prblems, turn on the LinkStation. E11 An error occurred in the fan speed. Check that no foreign objects or dust are clogging the fan. If any foreign objects or dust are found, use a pair of tweezers, air duster, or other tool to remove them. If the error is displayed again, contact techincal support for assistance. E12 System temperature has exceeded the maximum safe value. Do not place objects in the area around the LinkStation. Also, move the LinkStation to a cooler location. E13 An error occurred in the RAID array. It will run in degraded mode until the error is corrected. Replace the failed drive indicated by the red LED as soon as possible. After replacement, rebuild the RAID array after starting the LinkStation. E14 The RAID array cannot be mounted. Run the RAID array disk check in the LinkStation's Web Admin interface. E15 The bad sectors in the hard drive have reached a dangerous level. Replace the hard drive indicated by the red LED. E16 Unable to find the hard drive. The drive may be disconnected or may have failed. After shutting down, reinstall the hard drive. Mounting of hard drive failed. After formatting and rebooting, if the error still apears, replace the drive. If this error is displayed again, contact technical support for assistance. E23 An error occurred, so the hard drive was removed from the RAID array. E30 The hard drive may be damaged. Off Power is not connected.